Do you face the challenge, when it comes to supply chain budget? Is it difficult to cope up with the excess of inventory? Are you having too many people employed and still find the less work productivity? Worry not!!! Leverage the power of Bluetooth low energy by deploying beacons in warehouse to gear up with per square feet utilization. If you have your own warehouse and you are stocking huge inventory; you may be relying on the remote teams or an outsourced vendor to manage day to day operations – which means you do not possess much control over it, even if you wish to implement a smart warehousing program. In most of the retail companies, warehouse management is unorganized and not even recorded in an automated manner. 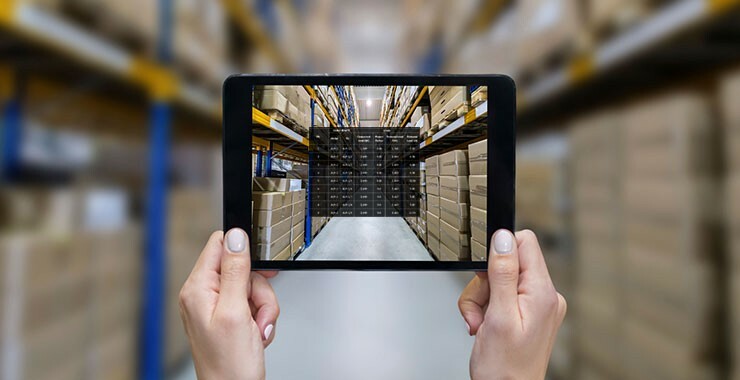 Although there exist an asset tracking tools like RFID tags, barcodes, GPS but when it comes to tracking assets indoors – GPS is useless, if you track the items across large space – ultra short range solutions are ineffective. But, all thanks to BLE technology, deploying beacons in warehouse can enable tracking every bit of information of your logistics and make sure that, principles of smart warehousing are followed to get high productivity. Bluetooth tags provide an affordable and adaptable infrastructure making it scalable, cost-effective and genuinely exciting solution for the traditional problems. How beacons in warehouse work? Beacons can be everywhere in supply chain; every trailer, every forklift, every loading dock bay, every warehouse shelf etc. Beacons can be tuned to broadcast the information at various smart devices adjusting the power output; as the device hears the beacons, it tracks what is nearby and when the device leaves the area, then too event can be recorded. By knowing where your goods are inside your warehouse in real-time, when they are checked-in or checked-out, in which zone they are currently in and the trails they take from entry to exit and much more. To be precise, beacons in warehouse offers unique opportunity for radical changes in daily operation for any logistic need. Let’s dig-in more to know what other perks beacons can provide…..
You can save time and money in your logistics and manufacturing operations by using beacons in warehouse to track the valuable assets. By deploying beacon on an important asset that you want to track; with the associated mobile app, it identifies and monitors the location in real time and collects the important data such as how often it was used, by whom, during which time and much more. To be precise, the associated worker can find the asset with ease, no matter where they are placed. Other than that, beacon ensures security by alerting the administrator if the secured assets are not properly handled or wrong person handling the assets. Reusing the warehouse assets like forklifts, containers, boxes etc helps the administrator to track their movements, flow of the materials and products carried within and much more. Other than that, you may have some components in the warehouse that you may not be using; by deploying beacons in warehouse, it can monitor your components and perform audits of ideal ones; ensuring their regular maintenance and deploying them to the zone of least distance moving to increase use of per equipment. Space is always the headache be it’s the homes, office or the warehouse. Many times, during loading and unloading stocks it may happen that we may forget to utilize some extra space or it’s just out of our sight and very difficult to recognize. Although, inventory audits can help in identifying the free space but can become unmanageable due to the time it takes to scan large warehouse manually. By deploying beacons in warehouse, it offers the chance to track the assets which means they can be stored in place and can be easily found when needed. Beacons provide instant visibility of available space and so, you can audit your goods and load/unload it in the proper place to optimize efficiency. Fluctuations in demand always impose serious challenges for warehouse managers. Managing seasonality stocks requires timely and precise information about manufacturing, retailing and industry. Information gaps between the warehouse and other relevant entities or the industry limits the ability of the distributor to monitor and respond to changes in demand effectively. It is necessary for warehouses to use timely and accurate information in planning and forecasting demand as well as exactly how much time is spent on which forklift? Where are packages spending the most time? By deploying beacons in warehouse, you can get generate accurate data and find out where errors are occurring. Other than that, beacons can also help in finding out the seasonal stock and rearranging items by alerting to place the product with high demand during current season. Products like drugs, packet eateries and other sensitive items requires perfect temperature tracking; if not done can lead to unnecessarily complicated solutions. Generally, employees manually check the numbers which adds more room for error. But, by deploying beacons in warehouse, it can handle sensitive items by carefully monitoring the temperature and even you can pull out updated inventory aging reports at a click of button. When the item goes bad due to the temperature or has reached the threshold of expiry date, you can further leverage BLE technology that provides the alerts to dump it instantly. Why you should use beacons in warehouse? It is difficult to predict what future holds for beacon in warehouse and logistics; but, beacons being high in demand due to the shortcomings of existing technology predict the high chance to stay for a longer period of time. Developing beacon based mobile app for your warehouse helps to leverage the business and helps to stand tall amongst competitors. BLE Mobile Apps is one of the BLE Beacon app development companies that helps the organization to cater the needs by developing beacon based mobile app to achieve your business goals. The company thoroughly examines the requirements and thus design and deploy an app after in-depth discussion with all the stakeholders. Looking to develop or any queries whirling in the mind…. Let’s discuss!